Before you start, you need to take a few measurements to make sure you have the right cistern. It is also important to check if your old cistern has an overflow. Nowadays toilet cisterns have no overflow. When measuring the cistern, you want to make sure the cistern’s fixing holes matches the toilet pan fixing holes. In this case, we have used Victoria Plumbing to find the right cistern for our clients. 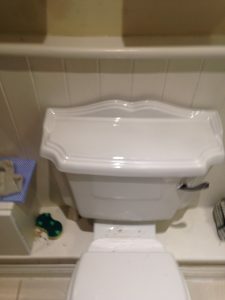 In the picture above, the client’s toilet cistern had a crack and was starting to leak. Changing the toilet cistern is not rocket science and everyone can do it. Locate the valve and turn off the main water supply. Flush the water off the cistern and see if the cistern is filling up again. If it does it means the mains are still on. 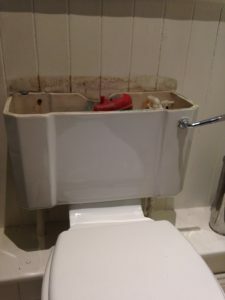 After you have emptied the cistern one more time and you are sure mains are off, use a sponge to absorb all the water from the bottom of the cistern. Start by removing the flushing handle so you can easily reach the 2 screws holding the cistern against the wall; locate the bottom screws that are holding the cistern against the toilet bowl and lose them up. Disconnect the fill valve from the feed pipe and gently remove the cistern. Follow the same steps but in reverse order making sure everything is tightened properly. Now turn the water on a fraction only and check for leaks before you turn it on fully. 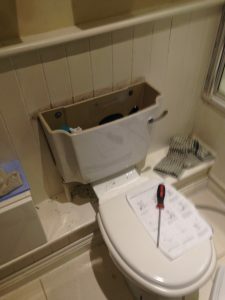 If you have decided which toilet you’d like to install but need help with the installation, 112Handyman can assist with installing your new toilet and removing the old one. 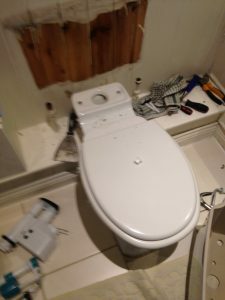 Give London 112 Handyman Services a call today and we’ll arrange a time that suits your schedule to remove your current toilet and install the new one. With 112 London Handyman Services, the hard work is taken care of and you’re left with a new and improved bathroom for family and guests. If you need a handyman to help you with fixing the taps please don’t hesitate to contact us. Please beware that the information contained in this website is for general information purposes only. www.112handyman.com assumes no responsibility for errors or omissions in the blog/website content. Previous Post Bathroom repairs Next Post How to Fix a Loose Tap Head?